A man in Germany discovered the dangers of driving an open-top car when an envelope containing 23,000 euros (£20,600) blew off the back seat. The notes rained down on the fast-moving motorway traffic behind him. Police closed the road in both directions for half an hour to search for the missing money. All but 3,000 euros was recovered. 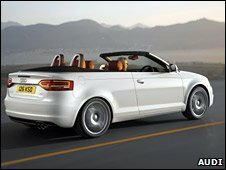 The man, 23, was test-driving an Audi convertible near Hanover, and the money was intended to pay for the car. The police have warned the public against scavenging along the motorway for the missing notes, pointing out that it would be illegal to keep them. And things could get even more expensive for the German test-driver. The police are considering charging him for the cost of the search. The motorway closure caused long tailbacks in both directions.